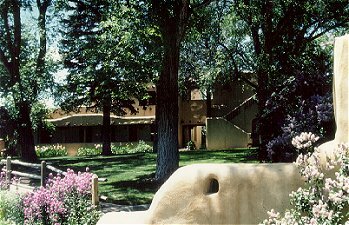 An historic Taos landmark providing Southwest ambiance, casual elegance, attention to detail and exceptional hospitality, just 2 1/2 blocks from Taos Plaza. Situated atop a small hill in the La Loma Historic district, the Inn features a quiet, intimate and romantic setting with expansive gardens and commanding mountain views. 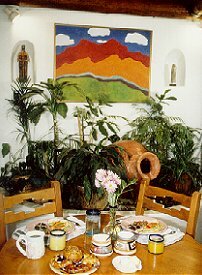 The Bed and Breakfast, built with thick adobe walls is beautifully restored and appointed with fountains, antiques, local art and provides spacious guest areas, rooms with fireplaces, private baths, patios, TV's and telephones. Some rooms have air conditioning, kitchenettes, private decks or patios and sofa sleepers. There is an outdoor hot tub and children's playground on premise and we provide complimentary health club, tennis court and pool privileges at a nearby facility as well as a healthy gourmet breakfast, afternoon snacks, beverages, evening coffee, and cookies. Poshest and most romantic inn in Town" USA TODAY; Mobil 3-star & AAA 3-diamond rated! This and other Taos Bed and Breakfast Inns can be found here in The Register.